“I want drinkers and winemakers to be shaken up, there are so many pathways that are undiscovered”. Michael Glover is taking us through a tasting of his latest releases from Mahana Estates and Mammoth Wines in Nelson, New Zealand. Here is a man who after years in the business is still clearly filled with the wonderment of producing wine, from putting the vine in the ground to sharing his thoughts on the glass in front of you. Prior to his move back to New Zealand last year, Michael spent 10 years making wine at Bannockburn Wines in Geelong, Victoria. 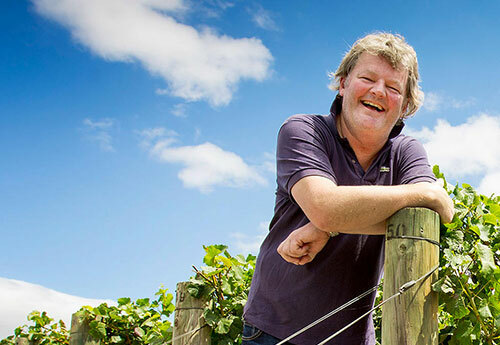 He has now returned to where he spent much of his youth in New Zealand, making wines at, as he puts it, his day job at Mahana Wines and his night job, Mammoth Wines. Set on the back verandah of Toorak Cellars in Armadale huddled around gas heaters we were treated to three brackets of wine with simple yet tasty food. The first bracket was a Pinot Gris, a Riesling and a Pinot Noir Rosé all from Mahana and all from the 2015 vintage. The Mahana Gravity Pinot Gris was a completely different wine when tasted with the two cheeses on offer – a creamy mozzarella and hard Comte style cheese. This wine “is a food servant” Michael tells us and it was undeniably transformed with the cheese. “I don’t pursue aromatics”, he tells the group, “I pursue texture … with skin contact, dirty ferments, lots of solids and so on”. This was borne out as the night progressed, perhaps showing the most with the Mammoth Pinot Noir which spends 5 days, stems and all, locked in the press allowing a bit of carbonic maceration to take place before the fermentation proper kicks off. Back at the first bracket the other stand out was the Riesling. The wine captures that magical balance between residual sugar (23 g/L) and precise acidity, creating a structure to the wine that shows both weight on the palate and lightness at the same time. Michael’s referencing of the Mosel in his description of this wine was apt. The next bracket consisted of two Sauvignon Blancs, both from Mahana. The first was from 2015 and the second, the Mahana Clays and Gravels from 2014. As with Michael’s Sauvignon Blanc at Bannockburn, the Clays and Gravels sees wood treatment with oak and with acacia wood. I warm to Michael’s description of Sauvignon Blanc as another food servant. With a market flooded with cheaply produced thin and acidic Sauvignon Blanc, the dominant way to drink Sauvignon Blanc has become as cold as possible and on its own. Served with food however, a good Sauvignon Blanc will show at its best. With this grape variety, Michael tells us that the goal is to take the drinker on a journey recognising the wine primarily as a “serious white wine, then a wine from New Zealand and finally that it is a Sauvignon Blanc” – a journey that is achieved with both these wines. The textured Mahana Sauvignon Blanc 2015 showed nettle, elderflower and a touch of passionfruit, while the Clays and Gravels was a different beast. Both wines posses an attractive palate weight and texture, but the Clays and Gravels offers a lighter more lifted aromatic profile of floral and herbal notes. The structure is intricate and delicate with sufficient roundness on the palate as to offer a highly enjoyable wine. The tasting finished with Pinot Noir – the Mammoth and the Mahana Clays and Gravels, both from 2014. These wines reminded me of Michael’s earlier description of his employment – Mahana being his day job and Mammoth his night job. The Mahana Pinot Noir was lighter in style of the two with more red fruit and herbal nuances. The Mammoth a more intense expression of Pinot Noir. It’s lifted aromas of violets, herbs and black fruit lead through to a powerful structure on the palate promising to reveal more personality in the years to come.